Did you see the Opening Ceremony of the Olympics? It was amazing… The “footprint” fireworks, the screen on the floor, the giant type face machine, the athletes walking across the paint, and then the guy flying through the stadium to light the torch!!! Awesome! The entire team sat through all four hours over dinner and watched it on a giant outdoor projection screen at an outdoor food market. 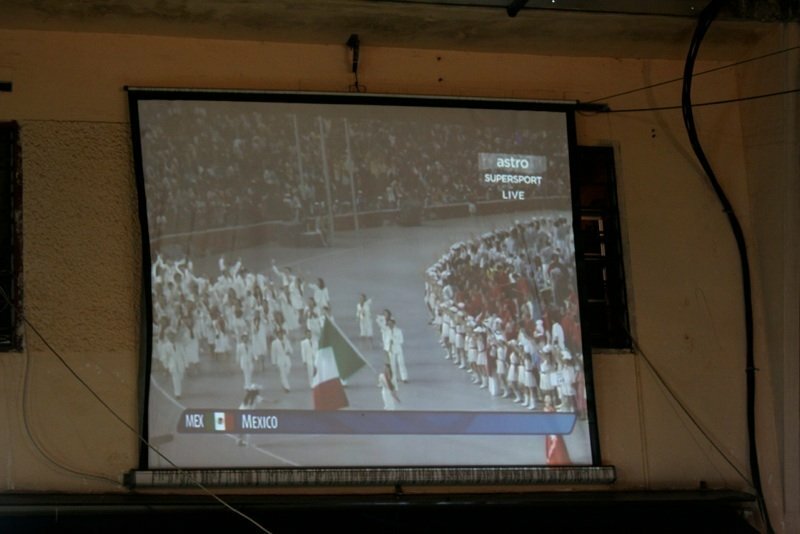 The picture above is of Mexico coming into the stadium!!! This morning, we had our first debrief discussion which went very well. I’m really happy we’re starting debrief before we actually get on the plane as there is so much to “unpack” spiritually, emotionally, and mentally that we can’t handle it all at once after we get back. This afternoon Ross, Josie, and I went with our friend Fleur to the local Badminton complex where we got schooled by a bunch of college age girls. It was actually a blast, not to mention a great workout. Malaysia is consistently ranked 3rd in the world behind Indonesia and China in Badminton. All in, a great day. Did I mention that I got to take another hot shower today? !